Dodger pitcher Ross Stripling tossed eight innings of one-run ball and didn’t allow a run until Eric Thames’ Sacrifice fly in the eighth. Stripline allowed just four hits and a while striking out three. The Brewers finished 2-4 on their trip out west, after they were swept by the Angels in Anaheim. They’re 10-6 on the season and are a half game up on St. Louis (9-6). The Cardinals are in Milwaukee on Monday night for the start of a three game series. Freddy Peralta (1-0, 6.91) gets the nod for the Brewers. Dakota Hudson (0-1, 2.79) pitches the opener for the Cardinals. The results weren’t strong, but reliever Jeremy Jeffress is reportedly ready to pitch in the big leagues and is expected to be activated in time for Monday night’s series opener against the Cardinals. 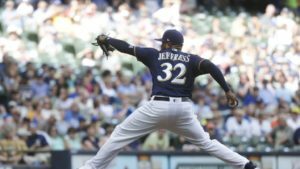 Jeffress allowed seven runs on nine hits, including three home runs in four games (4 1/3 innings) and leaves AAA San Antonio with a 14.54 ERA. With Corey Knebel sidelined for the season, the Brewers can use the bullpen help. Last season, Jeffress made a career high 73 appearances, going 8-1 with a 1.29 ERA. He saved 15 games and struck out 89 in 76 2/3 innings.